Tomorrow, I move into a new age category – MV50. In common with most people, when I was a teenager, I thought 50 was old, really old. I actually thought that 30 was old. At University, I remember laughing at my mate Ronnie’s brother-in-law when he came out drinking with us because we thought he was an old man. He was 25 at the time. Fifty is past halfway in a normal lifespan, but luckily I am healthy and fit. In fact, despite having led an active life and always participated in sport, I don’t think I have ever been fitter. I don’t know how that can possibly be, but I’m very grateful and intend to ride the wave for as long as I can. With a week to go to the marathon, this was the middle week of my taper so there were no long runs, but I still covered 47 miles and did some faster running. On Tuesday, I went to the Valley Striders session. Somewhat depressingly, it was the first one on our winter urban routes away from the tranquillity of the Eccup reservoir where we run in the summer. The fourth Tuesday in the month means hills – six times up a longish hill (about two and a half minutes) then a jog back recovery. I put it in and gave chase to one of our fastest runners – Simon. I didn’t catch him on any of the reps, but at least I made him work a bit I think. 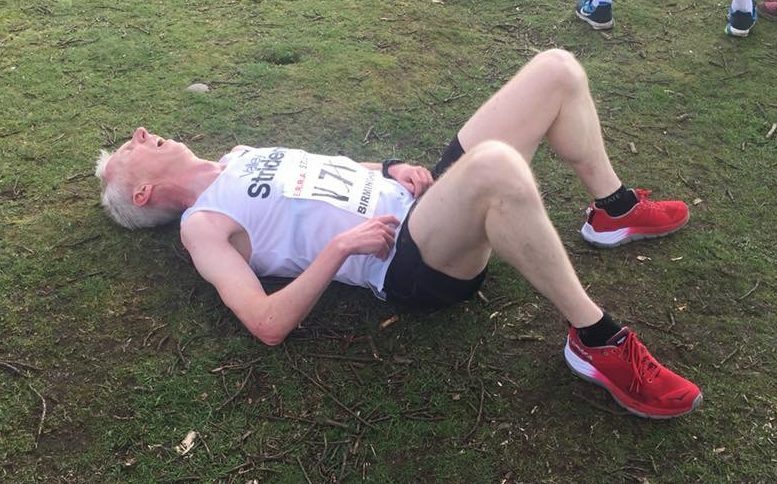 I had earmarked Saturday morning to have a dig at my 5K personal best –officially 17:36, but that was set on the old John Carr course (net downhill), so it’s got an asterisk next to it in my eyes. The true mark to beat was 17:41. I ran an unofficial 17:25 last week for 5K (according to my Garmin) at the Northern 6 stage road relays so I knew I was in decent nick. The York parkun course is on the ambulance track at the racecourse. It is almost perfectly flat and comprises one and a half laps of the Knavesmire, so there are no problems with congestion or overtaking. The only issue is that it is exposed and can be very windy. Luckily, yesterday in York the weather was still and misty, there was barely a zephyr – near perfect conditions. I did a decent warm-up – as I have to these days, and positioned myself near the front rank at the start. The winner at York usually runs under 17 minutes, sometimes under 16, so I stood behind a small group of young skinny lads, whom I’d guessed would hare off at the start. My plan was to try to run each kilometre as close to 3 minutes 30 seconds as possible, for an overall 17:30 target. I hoped to take some shelter from other runners to help me to reach my goal. We set off and one lad zoomed off way ahead. I found myself just behind a clutch of three, who obviously knew each other and were idly chatting. The first km was covered in 3:32, which was a little slow, but I felt that I was holding back. The other runners then seemed to slow and I had no option but to go past them and pick up the pace. I ran kilometre 2 in 3:29 and realised that I was catching the leader quite quickly. I used the old race craft trick of holding back for a few seconds just before I caught him, gathering myself and then surging past him really hard, hoping to prevent him from latching onto me. I knew that the third and fourth kilometres were the key. It’s this portion of race when one can slip off the pace – the third lap problem for mile runners. Fighting to overcome the lactic acid and oxygen debt, I dug in as hard as I could – kilometres 3 and 4 were covered in 3:32 and 3:35. My brain was a little scrambled with the effort but I knew that I was falling off my 17:30 target. I needed to dig deep and try to find some more speed for a big final kilometre. I got on my toes and drove my arms and tried to endure the agony. The final 250m included a couple of turns, then a 125m sprint to the finish line, at the final turn I heard people screaming “Come on James!”. “How the hell do they know my name?” I thought to myself, only to realise that they were cheering a young lad in second place who was gaining rapidly on me. I stared down the finish line and sprinted for all I was worth, I caught sight of his orange vest alongside me in my peripheral vision. With 40 metres to go I was absolutely all out, but I managed to find another kick and I might have even dipped for the line, just pipping him to cross the line first. A lifetime PB just two days short of my 50th birthday – I’m pleased with that. Sunday was the first race of the cross country season at Thornes Park in Wakefield. It was sunny and warm and the course was firm. I ran OK, maintaining a consistent 6:20ish pace throughout the undulating 9.5K course and was passing other runners for most of the race. The standard at the West Yorkshire cross country league is high and Valley Striders did well – the ladies coming 5th and the men 3rd. I was the 6th counter for the team. Tomorrow, I’ll spend my birthday going for a run around Swinsty and Fewston reservoirs, having lunch with my friend Hannah, then a sports massage and will round off the day with a Thai meal and beers with my family. Now that’s what I call tapering.